vocal cords the thin, reedlike folds of mucous membrane in the larynx; the superior pair are called the false vocal cords and the inferior pair are called the true vocal cords. (See also Plates.) They vibrate to make vocal sounds during speaking, and are capable of producing a vast range of sounds. Each cord has one end attached to the front wall of the larynx, close to that of the other cord. The opposite ends are connected to two tiny cartilages near the back wall of the larynx. The cartilages can be rotated so as to swing the cords far apart or bring them together. When they are apart, the breath passes through silently, unobstructed; when they are closer together, they partly obstruct the air passage, and as the air is forced through them they vibrate like the reeds of a pipe organ and produce sound waves. These waves are what we call the voice. See also speech. Pertaining to the voice or the organs of speech. 1. 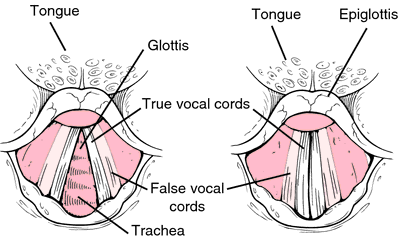 Of or relating to the production of sound through the mouth: the vertebrate vocal organs; a vocal defect. 2. Uttered or produced by the voice: vocal sounds. manifestation of organophosphate poisoning in foals characterized by irreversible severe inspiratory dyspnea and stridor. due to paralysis of the recurrent laryngeal nerve, e.g. in rabies. See also laryngeal hemiplegia. the folds of mucous membrane in the larynx, the superior pair being called the false, and the inferior pair the true, vocal cords. These thin, reedlike bands vibrate to make vocal sounds and are capable of producing a vast range of sounds.